Our first recipe share comes from Rachel in Massachusetts! 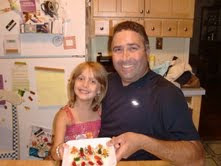 My name is Rachel, my Cooking Buddy is my daddy Andrew. We live in North Chelmsford Massachusetts. We sliced a whole banana into wheels and then put rainbow sprinkles on top. We then put a single “Gummy Bear” on top of each banana wheel. Decorate your banana slice with your sprinkles and gummy bears and enjoy! This sounds like a great recipe for me and my 2 yr. old daughter to make. Thanks for sharing it!